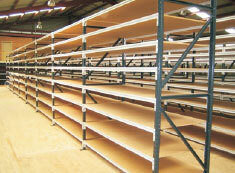 We manufacture and supply Medium Duty Pallet Racking System. These are sectional assemblage storing racks with scientific and reasonable structure design. These Medium Duty Pallet Racking Systems are easy to be dismantled and the layer height can be adjusted within 50 mm. We can provide all kinds of customized Medium Duty Rack to meet the assorted needs of the clients. Loading Capacity : 250-500Kg/layer, fit to manual middle scale and light goods storing.